Language is code. The speaker chooses the terms, sequence and intonations of their speech with the hope that the listener shares enough of the same human experience to recognize the intended meaning. Conversation is a negotiation as much as anything else. In conversation, the participants can adjust the selection of terms and details until they all reach an understanding of what is being said. 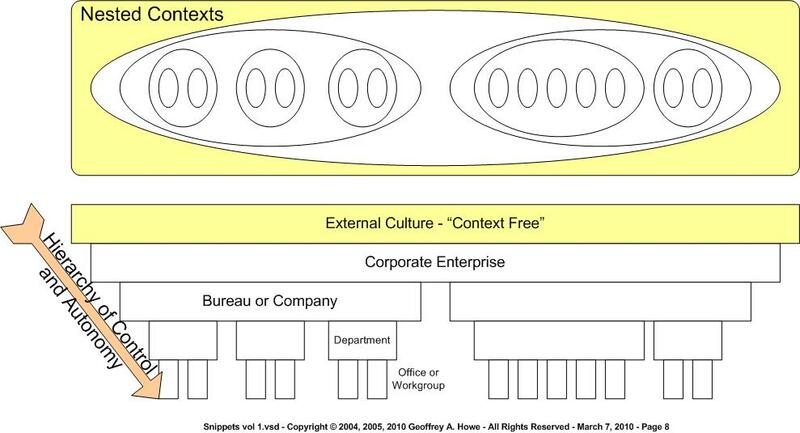 This is the practical meaning of “context”, then. In the context within which Chomsky was writing this sentence, reflective of common cultural experience of these terms among a broad community of American society, he made the claim that the sentence had no meaning. Since that time, other scholars have suggested that there may be contexts in which this construction of terms may actually be meaningful. This little example provides an excellent case study of the role context plays in communication. Never mind the fact that the sentence was first defined in a context for which it held no meaning. Since the moment of its invention, other contexts have either been recognized or constructed around the sentence in which it holds meaning. The notion of “context” as that mileiu which drives the interpretation of a sentence such as this is the same notion that explains how the meaning of any coded message must be interpretted. This would include messages encoded in the data structures of computer systems. Data within a omputer system is constructed within and in order to support specific information recordation and transmittal of things important to a specific context. This context is the tacit agreement between the software developers and the business community on what the “typical interpretation” of those computer symbols should be. The importance of context to the understanding of the data integration problem cannot be understated (which is why I keep coming back to it on this blog). While many theorists recognize the role context plays, and many pundits have written about the failures of computer systems when context has been ignored or mishandled, practitioners continue to develop and deploy applications with little explicit attention to context. All computer applications written in business today are written from some point of view. This point of view establishes the context of the system. Most developers would agree with these statements. The trick is to define a system which allows the context of the system to change and evolve over time, as the business community learns and invents it. It must be a balancing act between excluding the software equivalent of Chomsky’s meaningless statement, and allowing the software to adapt as the context shifts to allow real meaning to be applied to those structures.